Few groups of plants epitomize the qualities of delicate color in the summer garden better than the catmints, a group that embraces several genera, including Nepeta and Calamintha. Although I periodically abandon pastels to explore the hues on the wild side of the spectrum, more often than not I am held spellbound by gentle schemes of silvers, grays, soft blues, and pearly pinks in which the catmints play a pivotal role. The usual objection to these cool compositions that they are numbingly dull doesn’t carry much weight once you’ve seen a high-summer swarm of bees buzzing in a blue haze of Nepeta xfaassenii, By attracting bees and butterflies in such numbers, the catmints lend the garden both a quality of movement and an air of drama. In addition, these plants often pick up the pace just when the garden begins to falter, continuing as a strong presence until the first sharp frosts of autumn. As a rule, the catmints thrive on neglect. Full sun and a sandy, porous soil are best, although they will tolerate rich soils if they are well drained. Among their admirable traits are their longevity and their clumping nature–they seldom, if ever, need division or rejuvenation. Nor is self-sowing a problem, with the exception of the calaminthas. 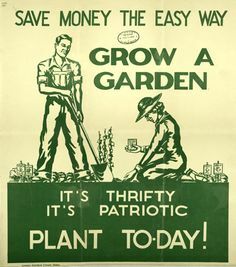 The commonly cultivated selections are hardy to USDA Zone 3, giving most North Americans the opportunity to give them a try. There is, of course, the Cat Problem. Catmints can indeed send some felines into a state of crazed euphoria, with predictable results for the garden. The best solution is aversion therapy. Try hiding small thorny stems of hawthorn, rose, or barberry among the plants. This delivers a surprise that will usually deter cats from wreaking any more havoc. For two centuries the most widely planted catmint was N. mussinii. 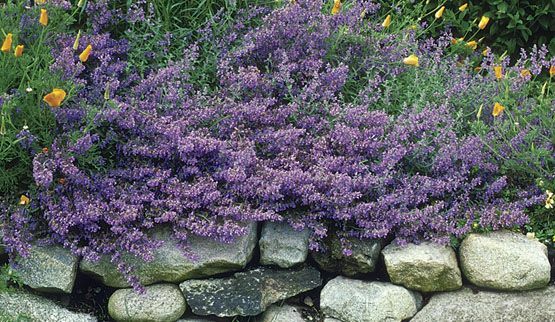 This species was especially popular in formal rose gardens, where, planted in wide sweeps and low hedges, it provided a long-lived, undemanding, drought-tolerant groundcover while enhancing the garden with a few weeks of lavender blossom. It was quickly superseded, however, by N. xfaassenii, a hybrid between this species and N. nepetella that was noted in the literature as early as 1784. Although N. mussinii is occasionally listed in catalogs today, in all likelihood it is actually this hybrid, which is far and away the better garden plant. Blossoming for months on end, its small lavender flowers appear in densely packed axiliary clusters on 15-inch stems among the soft, gray-felted leaves. I have used N. xfaassenii in several places in the garden in different combinations, and I never tire of its silk-and-steel quality. In one bed I have planted N. xfaassenii with salvias, diascias, and ornamental onions. Salvia xsuperba provides erect spires of dark blue-lavender, its narrow upright stems rising through a fog of lighter catmint blossom. Both are interwoven with the wiry stems of Diascia vigilis, whose spurred salmon flowers bring out the hint of rose in the buds of the catmint. Scattered throughout the planting are the eight-inch globes of Allium chrisophii, which peak at the same time, their starry lavender, greeneyed flowers hovering above the other plants. Chamaecyparis pisifera `Squarrosa Nana Aurea’ provides a year-long structural presence whose finely textured sprays of yellow-chartreuse foliage serve as a bright foil to the surrounding lavender blues. The middle part of this bed is dominated by clary sage (Salvia sclarea var. turkestanica), a biennial that politely self-sows. Its soft pink, globular buds, which emerge from large basal rosettes of felty grey foliage, are just beginning their upward thrust when it is time to shear the nepetas, other salvias, and diascias back to the ground, leaving the allium seed heads to dry like elfin tumbleweed. By late July and early August, the clary sage is in its prime, with six-foot stems cloaked in translucent rosy white bracts that subtend each flower. Repeating its spring performance, the nepeta is again cloaked in finery, looking none the worse for its earlier clipping. In a bed devoted to roses, I have fallen back on the tried-and-true pairing of nepetas and dianthus to provide groundcover and edging. Here I have opted to use the cultivar of N. xfaassenii known as `Dropmore’, which has a slightly deeper flower color (although it certainly does not eclipse the unselected form of the hybrid). Planted on 18-inch centers, it forms an impenetrable overlay of flowers in June. Interplanted with the nepeta is Penstemon canescens, a long-lived deciduous species with erect two-foot stems packed with soft pink flowers that emerge from darker buds. Rising above them is the musk rose `Nastarana’, with quantities of single white-blushed blossoms opening from buds of shell pink. This composition has a strong presence and yet retains an inviting softness. Similar in appearance to N. xfaassenii but much taller is N. `Six Hills Giant’ (hardy to USDA Zone 3; to 3 ft.). Thought by some to be a selection or hybrid of N. gigantea, it is a useful plant for the midborder, and is more tolerant of damp conditions than N. xfanssenii. Originally I interplanted `Six Hills Giant’ with Allium cernuum, whose pink to pinkish white, nodding 18-inch flower heads rose through the wolf-grey foliage and lavender froth of the catmint. By the third season, however `Six Hills Giant’ finally lived up to its name, all but burying the alliums. I now use this plant with Eaphorbia wallichii, whose sturdy two-foot stems gather the catmint’s blossoms around its glowing chartreuse flowers, which are produced in late June. A midsummer shearing encourages the catmint to reblossom, concealing the now derelict stems of the euphorbia. Nepeta sibirica (Zone 3) departs from the sprawling nature of many members of the genus, producing upright two-foot stems, and larger, more substantial, light blue flowers. The tubular blossoms, with an extended lip marked with white, are produced in quantity throughout the summer. More frequently seen than the pure species is its hybrid offspring, N. `Souvenir d’Andre Chaudron’ (which seems to be the same plant as `Blue Beauty’). Growing to 18 inches, it is a useful front- to midborder perennial. A good companion is Geranium wallichianum `Buxton’s Variety’, whose wiry stems, bearing multitudes of white-eyed, lavender-blue flowers, occasionally scramble into the nepeta. Unlike most catmints, which prefer warmth and a lean, well-drained soil, N. govaniana thrives in moist, cool conditions. It also differs from its relatives in producing large tubular flowers of clear yellow held on upright two-foot stems. Despite its delicate appearance, I have found it to be a long-lived and sturdy perennial. 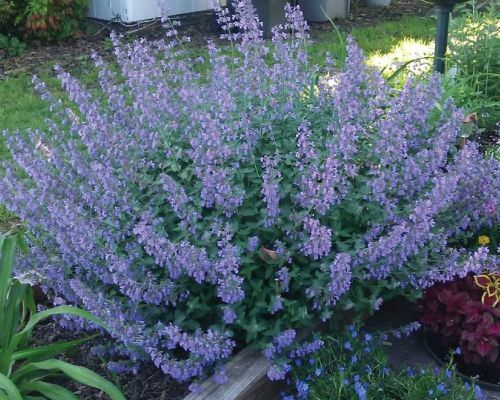 In my garden, it is valuable for adding a warm touch to a planting of Salvia guaranitica, whose erect five-foot stems bear flowers of chilly indigo. In addition to the more commonly grown catmints, I am very fond of several lesser known species. Nepeta adenophylla (Zone 6) is a green-leaved plant that grows to five feet and remains strongly upright, even following the border-flattening rains so common here in the Pacific Northwest. Its flowers are a good light blue with just enough pink in the buds to combine well with the carmine spikes of Polygonum amplexiaule. More frequently found in commerce, N. grandiflora is smaller in stature, with slightly larger light blue flowers, though its specific epithet is a bit overstated. Both species bloom profusely from June to early October. Six years ago I raised N. tuberosa (Zone 7) from seed and was delighted to discover that it was as remarkable in foliage as in flower. Densely packed spikes of velvety purple-blue flowers rise two feet from woolly silver-grey leaves. As its name implies, it forms cubers that may rot during dormancy in moisture-retentive soils; sharp drainage and a warm location will help prevent this problem. The dwarf form of this species is attractive as well. It forms a prostrate carpet of superb grey foliage in early spring, followed by multitubes of six-inch purple flower spikes that remain in bloom for up to eight weeks. Both forms associate well with Lilium formosanum, an easily cultivated lily species with exceedingly fragrant trumpets; its purple-striped white petals subtly reflect the color of these lovely catmints. In blossom and foliage, from early summer through late autumn, these long-cultivated perennials lend themselves perfectly to gentle-hued compositions that stir the heart and senses. In my own borders, they have helped me realize the calming qualities of the summer garden.